Volunteers in Argentina have been coming up with some ingenious ways of fundraising to support one of our Care projects recently. 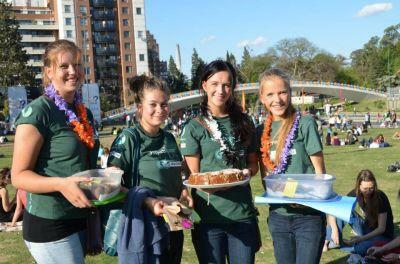 One Saturday in October three teams of volunteers set out to the green parks of Cordoba to sell homemade cakes to the locals. One team offered customers a free tune on the saxophone for each slice of cake purchased, whilst another offered a kiss on the cheek for 5 pesos and a hug for 2 pesos! With offers like that, the teams soon sold every last slice of cake and in total raised over $1000 pesos! This hard-earned money will now be spent on a new door for the Hogar Infantril Estrellitas Belen Care placement. This event was a fantastic success and is all down to three volunteers who were eager to make a difference, Luisa (from Germany) and Sarah and Lauranne (from France). It just goes to show that volunteers can really use their own initiative and make valuable contributions!